Welcome to Summer Senior Savings! 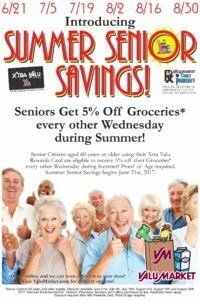 Seniors Get 5% Off Groceries* every other Wednesday during Summer! 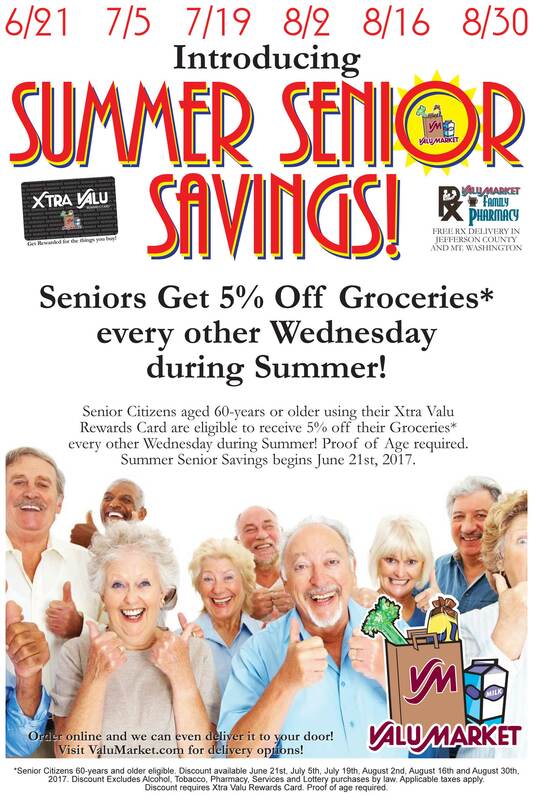 Senior Citizens aged 60-years or older using their Xtra Valu Rewards Card are eligible to receive 5% off their Groceries* every other Wednesday during Summer! Proof of Age required. Summer Senior Savings days are June 21st, July 5th, July 19th, August 2nd, August 16th and August 30th, 2017. EXTENDED THROUGH SEPTEMBER! Seniors will now get the discount on September 13th and September 27th as well! *Senior Citizens 60-years and older eligible. Discount Excludes Alcohol, Tobacco, Pharmacy, Services and Lottery purchases by law. Applicable taxes apply. Discount requires Xtra Valu Rewards Card. Proof of age required. Limit one discounted transaction per discount day. See store for complete details.